As young boys our mom told us many stories about her growing up on the farm “Macaw Bank” where she was born. Macaw Bank is a small farm up river from San Ignacio. Her parents were Candelario De La Fuente and Dora De La Fuente nee Andrews. All of Mom’s stories were exciting. Mom was raised by her fraternal grandparents, who were Papa Chindo (Gumercindo) and Mama Lela (Aurelia) De La Fuente. There was a special bond between them, and my Mom, Lydia, helped them in their bakery. She attended the Catholic school in San Ignacio and after completing Standard Six, and because her grandparents were not able to send her to high school in Belize City, she was asked by the nuns, who had a close bond with her, to repeat Standard Six. Lydia also helped out at the school. When Mama was eighteen years old, she heard of an expedition that was being planned by her aunt and uncles. 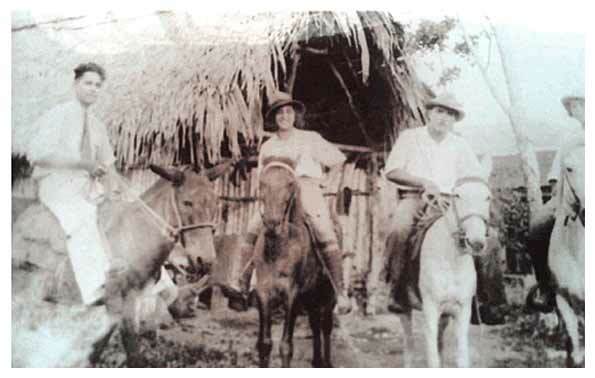 It was the year 1936 and the trip was to journey from San Ignacio to Stann Creek and return on horseback! Being an outdoor person, Mama begged to go on the trip. In 1936, there were no roads but only partial trails. The expedition was to be made travelling through Pine Ridge, the savannahs and jungle. After some planning, the trip took off. The picture shows, from left to right, Henry Andrews, known as uncle Didi; my Mom Lydia; Albert Andrews, known as uncle Bertie; and Florence Andrews, known as Aunt Flo. These were mamas, maternal uncles and aunt. My maternal grandmother, Dora Andrews, was the eldest of the Andrews children. Their parents were Albert Andrews, an Englishman who was married to Canuta Andrews nee Cocom Thompson, also known as Mama Noot. A resort in Stann Creek was named after her. The expedition finally took off and they carried supplies which would sustain them along with what nature afforded them, such as fruits, game meat, etc. They travelled by day, crossing rivers, creeks, swamps and other terrain. Apart from experiencing treacherous moments, there were many beautiful sceneries. At night they would camp and take turns keeping the camp fire going. Many nights they were kept awake by wild animals, including jaguars. Mom always related these events to us boys in great detail. After many days and nights the expedition reached Stann Creek, and after some rest they made the return trip. A few years after, mama met and married Otto Petersen, a Danish man who had migrated to British Honduras. They had four children — Helga, Dora, Otto and Hjalmar. Mama was widowed at an early age and after some time she met my dad, Jose J. Ramirez, and married him. They had three children — myself Alfonso, Richard, and the youngest, Gustavo. Mama gave of her talent to Belize. For many years she hosted two programs at Radio Belize. One was for the kids and the other was for the housewives. She sang and played on her guitar entertaining many audiences. Mama passed in the year 2003. This short story is dedicated to you, Mom: we will never forget you.